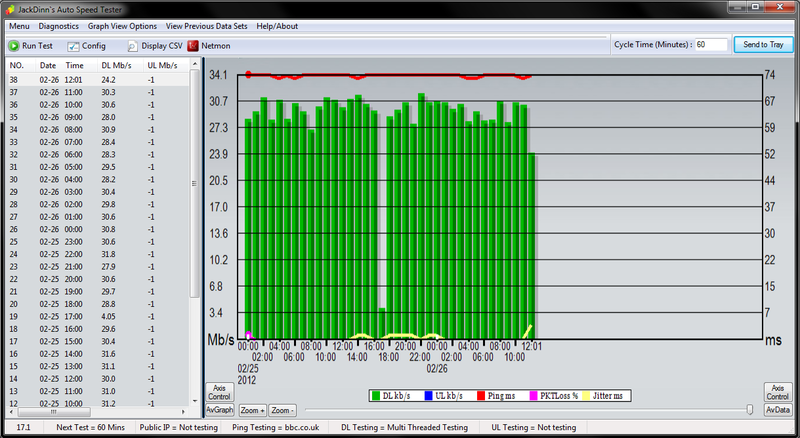 Since migration over to Ask4 I'm happy to say speeds have been very consistent around the 30mb mark. Usually I would get about 32/33mb on RiPWiRE. No major issues though. Take the stability any day of the week. 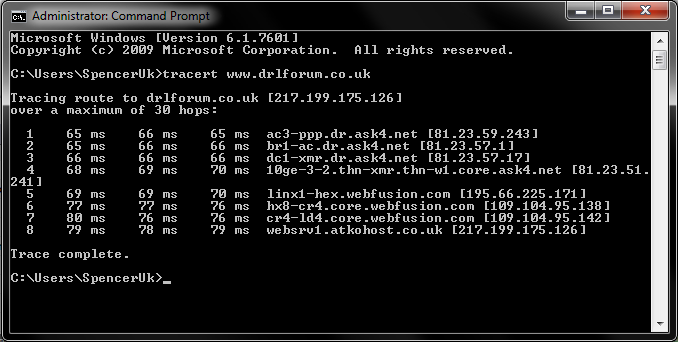 Still have the issue with the ping though. Only blip was today and yesterday where speeds were lower. (26-02-2012 09:18 PM)SpencerUk Wrote: Since migration over to Ask4 I'm happy to say speeds have been very consistent around the 30mb mark. Usually I would get about 32/33mb on RiPWiRE. No major issues though. Take the stability any day of the week. Still have the issue with the ping though. Thats an interesting ping you have though what causes that ? 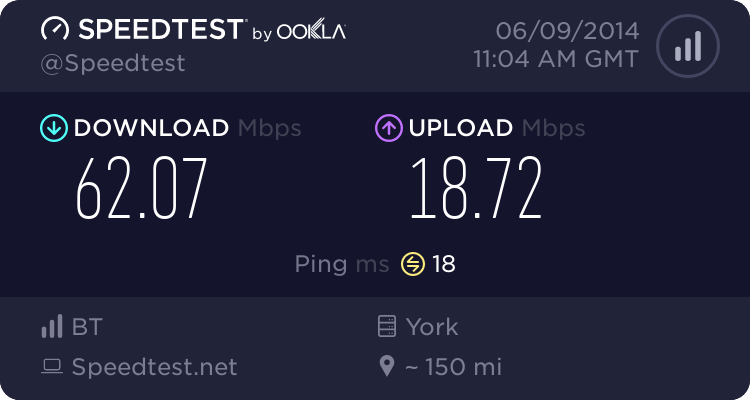 I have found that my connection speed has improved since the migration to Ask4 from Ripwire. Previously, I was lucky if I got even close to 11Mb download and usually had about half the download speed for upload. 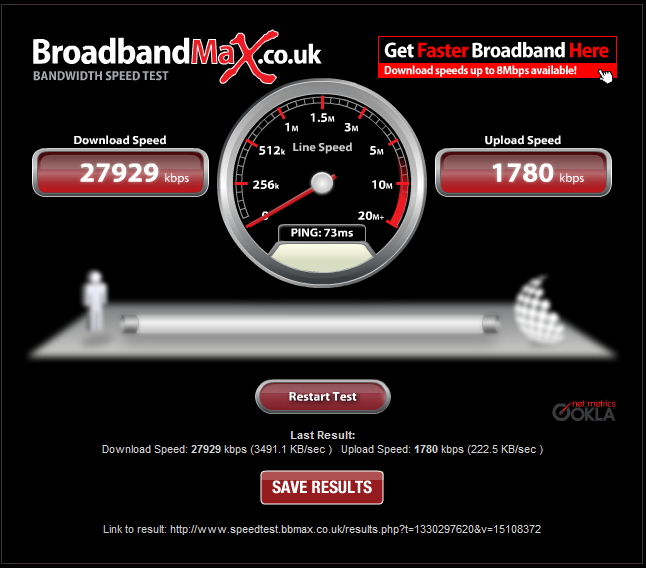 Since the switch to Ask4, I now get around 16.5Mb down and 2.xxMb upload - so a big reduction in upload speed. Strange how Coventry seems to have moved further away by 50 miles since the change over as well. I'm surprised that Digital Region provisioned a circuit below an estimated 15mb throughput. Given how quickly a VDSL signal deteriorates and all. Curious, You must be atleast 1500-2000m from the PCP..Either that or you have aluminium cabling. @SpencerUk Sorry about the delay in replying. 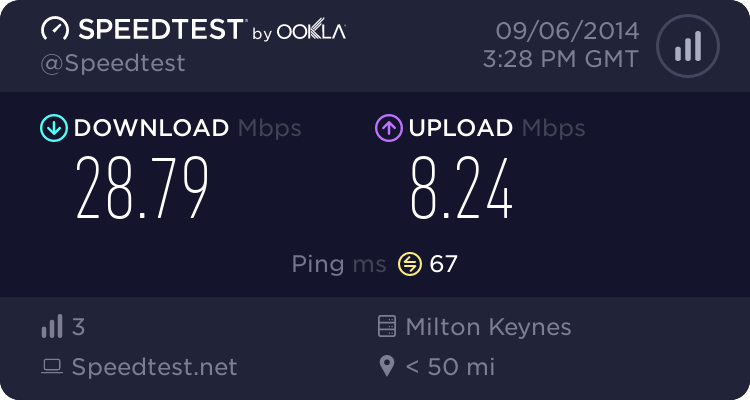 I was surprised (and disappointed) at how low the download speed was when I first connected to DR - but it was still about 4 times faster than my previous ADSL connection with BT Broadband for the same money. I did query it with Ripwire very early on and they came back with the answer that the NOC had looked at/tested my line and said that 10MB was the expected rate. 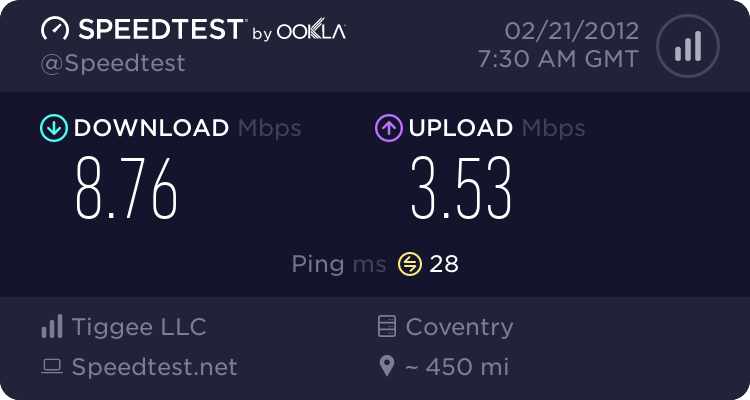 According to Origin's Post Code checker, I am 0.8km from the cabinet and could expect 28.5 down and 10 up. 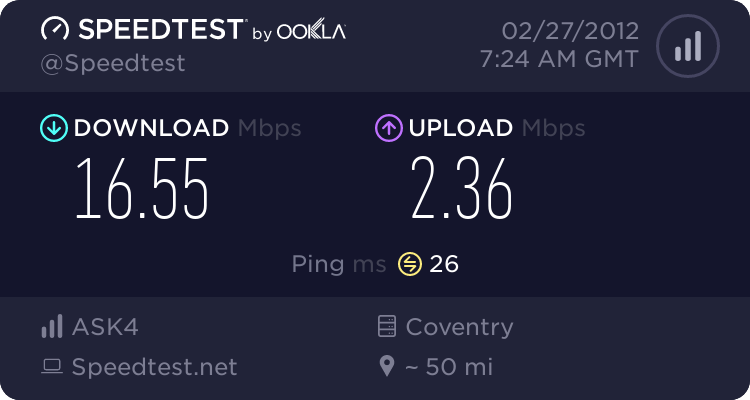 I was considering switching to them to see if I would get that sort of speed but I plan to speak to Ask4 once the Ripwire fallout has settled. I know that both my neighbours (who are on ADSL) get around twice what I was getting so there maybe a problem with my line. I know the internal wiring is OK. Mind you, I'm definitely happy to now have around 15-16Mb download. As @SpencerUk said I am also very surprised that DRL provisioned your line for their services if it was going to be less than 11Mb sync down. As I’m sure many people will have said to you during trying to resolve this issue the speed estimate given is of course just an estimate and there is never any guarantee for what speed you will receive with that said I don’t think DRL will provision a line as mentioned for anything expected below 15Mb. Despite Origin’s postcode checker saying that you will get 28.5Mb down I wouldn’t have said this would be the case if you switch your service to them as your line is currently in sync on the DRL network and therefore the NOC will see what speed your Cellpipe is in sync at and with a throughput of around 17Mb now the line is most likely in sync around 18/19Mb. Just to confirm you have definitely got your Cellpipe plugged into the master socket (NTE) within your house and not a secondary phone socket. 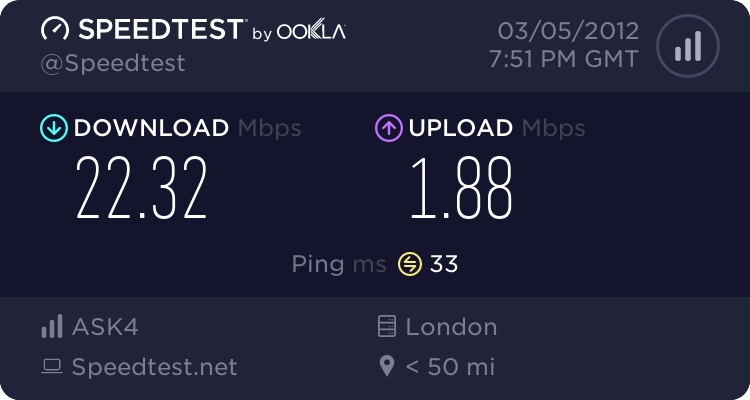 If this is the case and your speed is this poor and with you mentioning neighbours having a better speed on ADSL than you did as @SpencerUk said it maybe that your line is been fed on an aluminium pair and not copper, therefore resulting in a poor speed. However, if all lines are same cabling type it’s likely that you’re connected to a poor quality D side of BT’s network. This is basically the cabling from the PCP (Green Cabinet) to the Distribution Point (Pole/Manhole). If this is the case then a BT Openreach engineer would be required to identify and test a better cable pair to feed your line in order to rectify the problem and increase speed. Hope this info helps and if you could speak with Ask4 to obtain your DSL line stats from the NOC this would show your current sync speed and confirm it’s not a network issue etc. 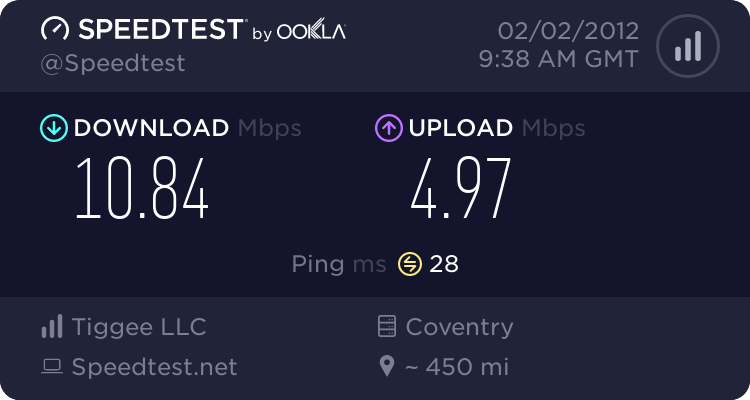 I've just got back after a week away and my download speed has never looked healthier. 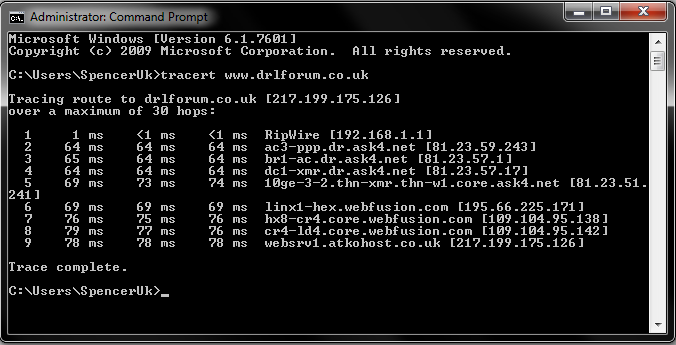 I'm on the capped (24/2) package and my average speed with Ripwire was around 18.5Mb.